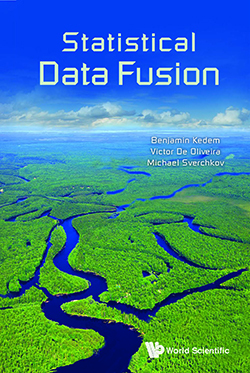 Statistical Data Fusion; a new book for graduate students, researchers, practitioners of statistics, engineers, scientists; has just been published by World Scientific. The book is co-written by ISR-affiliated Professor Benjamin Kedem (Math); his former student Victor De Oliveira (Math Ph.D. 1997), a professor at the University of Texas at San Antonio; and Michael Sverchkov of the U.S. Department of Labor Bureau of Labor Statistics’ Mathematical Statistics Research Center. Because the world is awash with data obtained from numerous and varied processes, there is a need for appropriate statistical methods, which in general produce improved inference by taking as input the information from many sources. This new book comes up with estimates or decisions based on multiple data sources as opposed to more narrowly defined estimates or decisions based on single data sources. It contains numerous examples useful to those working in genomics, sensors (radars), small area estimation of body mass, estimation of small tail probabilities, and predictive distributions in time series analysis. The ISBN number is 978-981-3200-18-0.